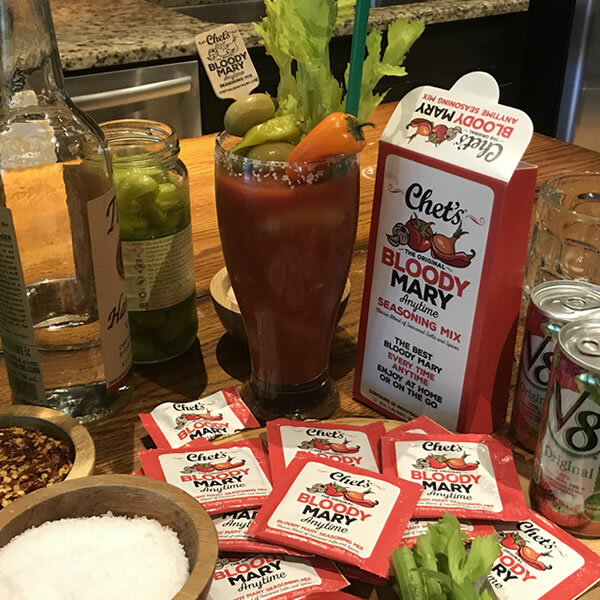 With Chet’s Anytime Bloody Mary Seasoning Mix Packets, you can now make one or as many Bloody Marys as you like. Each convenient box contains 12 individual Bloody Mary Seasoning Mix packets. Simply tear open a packet, add it to your favorite tomato juice and vodka and you are done. Bloody Mary Seasoning Mix – Use at Home or On The Go! It is so simple to use. Take these individual packets and make yourself a Bloody Mary at home. Gotta run? Perfect. Grab as many packets as you like and hit the road. The packets are water proof and non-perishable and can be used anytime any where. Take them on a plane, to a tailgate or to a bar to fix a crappy Bloody Mary.